New findings help rewrite the story of how the iconic and mysterious Eta Carinae star system came to be and present a critical piece of the puzzle of how very massive stars die. The aftermath of the “Great Eruption” of the mid-1800s, which is now readily visible through a small telescope if you happen to be in the Southern Hemisphere, made Eta Carinae a celebrity among objects in the universe known for their bizarre beauty. An hourglass-shaped, billowing cloud of glowing gas and dust enshrouds the star and its companion. Known as the Homunculus nebula, the cloud consists of stellar material hurled into space during the Great Eruption, drifting away at 2 million miles per hour. 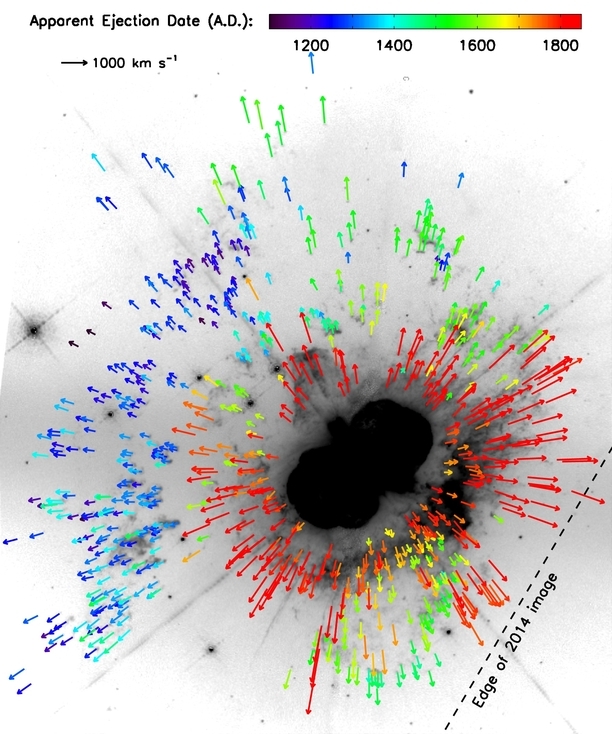 By carefully analyzing images of Eta Carinae taken with NASA’s Hubble Space Telescope, Kiminki and her team were surprised to discover that the Great Eruption was only the latest in a series of massive outbursts launched by the star system since the 13th century. Published in the journal Monthly Notices of the Royal Astronomical Society, the paper was coauthored by Nathan Smith, associate professor in the department of astronomy, and Megan Reiter, who earned her PhD from the same department last year and is now a postdoctoral fellow at the University of Michigan. Although the glowing gases of the Homunculus nebula prevent astronomers from getting a clear look at what’s inside, they have figured out that Eta Carinae is a binary system of two very massive stars that orbit each other every 5.5 years. Both are much bigger than our sun and at least one of them is nearing the end of its life. Because the Homunculus nebula is such an iconic and visually stunning object, it has been a popular target of astronomical observations. A total of eight images, taken over the course of two decades with Hubble, turned out to be a treasure trove for Kiminki and her coauthors. The original goal of the team’s observing program was to measure proper motions of stars and protostellar jets—fast streams of matter ejected by young stars during formation—in the Carina Nebula, but the same data also provided a powerful way to measure the motion of debris ejected by Eta Carinae itself. In addition to having a separate origin in time, the older material also showed a very different geometry from the Homunculus, where material was ejected out from the star’s poles and appears symmetric about its rotation axis. Eta Carinae’s eruptions provide unique insights into the last unstable phases of a very massive star’s life. Researchers who study supernovae have identified a subclass of supernova explosions that appear to suffer violent eruptions shortly before they finally explode. Smith notes that Eta Carinae might be our nearest example of this.